1756-96. He was baptised in Shoreham, Sussex on 17 March 1757, the eldest of five sons of Henry Roberts and his wife, Susannah Stow. Roberts was initially placed for ten months on the books of the yacht Mary as a captain’s servant during 1771-2. He served in Captain James Cook’s second voyage of exploration aboard the Resolution from July 1772 until July 1775 as a midshipman, and was again aboard the Resolution in Cook’s third voyage as a masters’ mate from 1776-80, during which expedition he witnessed Cook’s death at the hands of Hawaiian natives on 14 February 1779. On coming home he was commissioned lieutenant on 28 October 1780, and he saw duty as the second lieutenant of the Portsmouth receiving ship Dragon 74. From 1781-4 Roberts was employed by the Admiralty in completing the charts drawn up during Cook’s voyages for eventual publication as a world chart. His suitability for this role was challenged by his previous shipmates James King, who considered that he worked too slowly, and William Bligh, who felt that he should have been entrusted with the task. By the spring of 1784 Roberts was commanding the cutter Speedwell in the preventative service in the Channel, being based at Cowes on the Isle of Wight. He captured a large smuggling vessel on 17 January 1785 which he escorted into Rye, and during May he brought the infamous smuggling vessel Water-Balloon, commanded by the notorious Pye Happs, into Shoreham, despite her crew’s attempt to scuttle her and destroy the illicit cargo. Roberts was still commanding the Speedwell out of Cowes at the beginning of 1788. In late 1789 he was ordered to commission the new exploration vessel Discovery 10 at Deptford for a voyage to the far side of the world. The noted botanist and naturalist Sir Joseph Banks visited the ship in December to ensure that it would be able to transport home the exotic plants he wished to see collected for the King’s gardens at Kew, and the vessel was eventually launched just before Christmas. Roberts was promoted commander on 1 January 1790, and the commissioning continued throughout the early months of that year so that she was nearly ready for sea at the end of March. Shortly afterwards it was announced that the Discovery would depart in June, and at the same time it was also stated that an addendum to Roberts’ orders would be to seek out the Bounty mutineers. Unfortunately for Roberts the departure of the mission was delayed by the Spanish Armament which arose from the disputes over territorial rights in Nookta Sound, and when news of the mutiny on the Bounty in the Pacific Ocean and the wrecking of the Guardian in the southern Indian Ocean was assimilated by the Admiralty it was decided that a ship could no longer be sent to distant waters without a consort, leading to further delays. 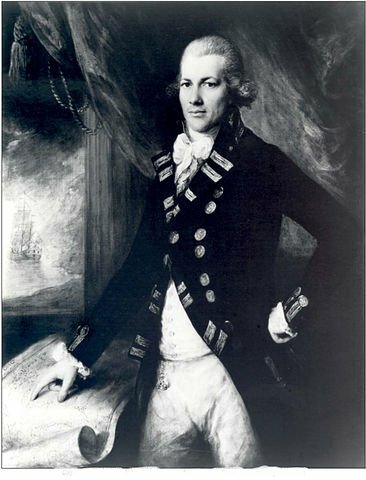 A re-appraisal of the Discovery’s mission followed with the result that in December it was announced that George Vancouver, whom Roberts had originally selected as his first lieutenant, would sail in command of the Discovery, and although it was intimated that Roberts would follow in due course as the commodore of the expedition this never happened. In July 1793 it was reported that Roberts was to take command of four sail of the line in the Portuguese service commanded by other British captains, but again this posting did not materialise. Roberts was eventually posted captain on 28 August 1794, and in July 1795 he was appointed to the captured French frigate Aréthuse, renamed the Undaunted 38, with which he sailed for the West Indies in the company of the Alfred 74, Captain Thomas Drury, and a convoy in the following spring. The Undaunted was attached to the force led by Captain Thomas Parr that took Demerara and Essequibo in April 1796, and Berbice in the following month. In August 1796 Roberts hoisted the broad pennant of Commodore John Thomas Duckworth aboard the Undaunted after Rear-Admiral Sir William Parker, the commander-in-chief at Jamaica, had been forced home through illness, but Roberts himself was taken ill with yellow fever and he died at Jamaica on 25 August. To compound the misery over his loss the Undaunted was wrecked on the Morant Keys two days later under the command of Lieutenant Robert Winthrop, Roberts’ son, who had been serving with him on the Undaunted, died of the same causes within days of his father, and the night after informing Roberts’ widow in Sussex of her loss Roberts’ brother also expired. On 30 November 1782 Roberts married Harriet Stow at St. Gregory by St. Paul’s, London and they had issue six children including five daughters who received an annuity, as did his widow, upon his death. During the 1780’s the family resided at Cupola House in Shoreham. Roberts was a skilled cartographer who excelled in drawing up charts and painting coastal profiles. He was described as ‘a very clever young man’ by one shipmate, ‘intelligent’ by another, and ‘well-informed and ‘ingenious’ by the Kentish Gazette. Point Roberts on the northern tip of Washington State is named after him.